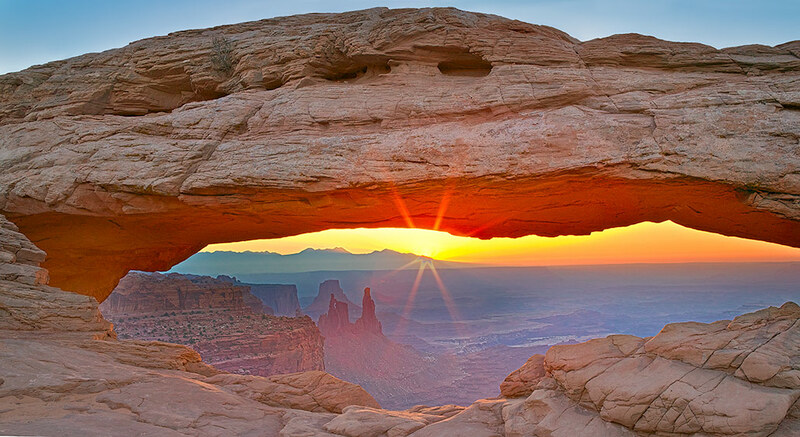 I recently had a client who was interested in a sunrise shot of the Canyonlands, which gave me reason to review some raw files from my Canon 1Ds (that camera is now long gone) that I shot in 2003. 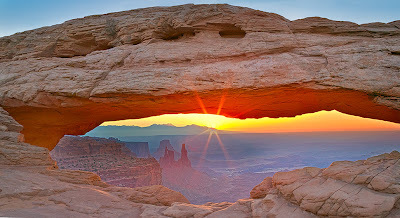 Much to my delight I came across a sunrise shot showing a sunburst coming through Mesa Arch. I think that I did not develop this image back in 2003 because there was not HDR (High Dynamic range) processing at the time, and I could not reconcile the frame that had the correct sky exposure with the correct arch exposure. Using Aperture I went back and re-developed the 2 raw files (one exposed for the sky and one for the arch) and combined them using Photoshop's pro-HDR. Voila, I now have a wonderful new image that would have been almost impossible to develop prior to HDR tools and the latest RAW processing tools. The image upsampled nicely in OnOne Perfect Resize 7. Maybe 10 years from now we will be able to re-process our earlier files to get rid of motion blur, all traces of noise, and severe under or overexposure. Be sure to hang on to all your RAW files, you never know when they will come in handy!